ObjectiveFS supports latency heatmaps in version 4.1 and newer. The latency heatmaps are useful for performance tuning and are not for production use. Mount OFS in the foreground with “-v” switch. To toggle between latency heatmaps, press Ctrl-\ to send the SIGQUIT signal to ObjectiveFS. Color bar to verify your terminal can display heatmap correctly. The colors are in log scale, where darker tones represent fewer events and lighter tones represent more events. During activity, rows are displayed after 5 seconds and show the cumulative events since last displayed. Latency in log scale, ranging from 0.25us to 1000s. 5. 99th percentile of latency for the events on this row. 6. Total number of events on this row. 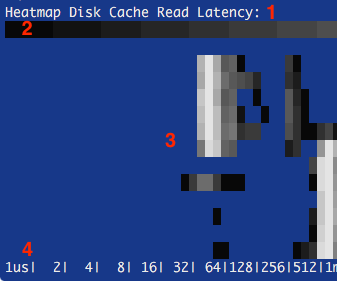 The disk cache read latency heatmap above shows two clusters of reads. 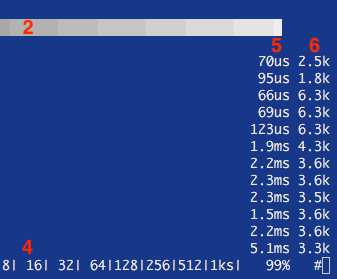 The initial faster reads (40-80us) show hits in the kernel cache, and the second group of reads (0.5ms-1.5ms) show hits in the disk cache.